For you chocoholics....this is a WINNER! Melt chocolate: Place shaved cacao butter and cacao paste in a metal bowl, placed on top of a smaller bowl filled with hot water. Add coconut oil and stir together as it melts. While waiting, place nuts in zip lock bag on hard surface and smash with a mallet, creating uneven chunks of nuts. Add maple syrup, agave nectar, and extracts to melted ingredients, add lecithin, and stir. Take off of warm water. Let sit for a few minutes and then place back on top of fresh hot water and let melt again. Add smashed nuts, raisins, cherries and coconut. Stir until well coated. Pour mixture onto a cookie sheet covered with parchment and spread about 1/4" thick. Place in freezer to set. Remove from freezer and break into chunks. Store in freezer. Warning: This is NOT like M&Ms and it does melt in your hands if you don't get it into your mouth fast enough. Yummm...Oh yeah! "RAW"nchy chocolate! I eat it right out of the freezer (and then LICK. LICK, LICK!). 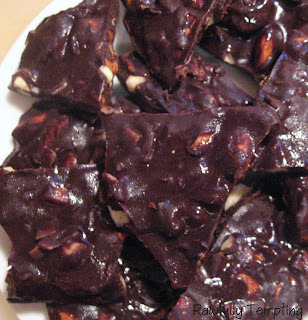 For darker chocolate, use more cacao paste. For milk chocolate, use less cacao paste. ***Adding more cacao butter and/or paste, using less coconut oil will make this more solid. Feel free to experiment with extracts and combinations of these ingredients. Have fun and share your results. Note: Mention Rawfully Tempting in Shipping Comments and Medicine Flower will include a special bonus sample with any purchase. In fact, you can ask for a sample of a specific flavor or product you are interested in trying. When available, they will accommodate. Hey thanks for this! I just rediscovered your blog and have to tell you i was shocked you had no comments on this recipe. It is EXCELLENT! I made this way back when and think your variations and discussion about how much cacao butter or paste to use is straight on. i have made it without coconut oil altogether but find the coconut oil really contributes to the creaminess. I'd love to use freeze dried fruit but it is so expensive! but we have all liked the variation you have here. To keep costs down, we have also used hemp plus granolas; to reduce calories, we have used koala crisps. egardless, this is a great base and I thank you for all the wirk you have put into this excellent blog! Thanks so much for your kind words and feedback. 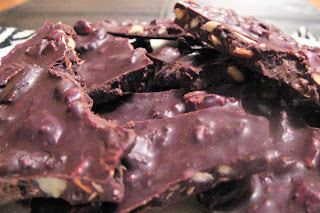 I KNOW..i love this bark...but have not made it myself in a LONG time. Hmm...Valentines day is coming up..I think I'll re post this....Glad you enjoyed it and had fun with your variations! i HAVE NO IDEA WHERE TO BUY THESE?